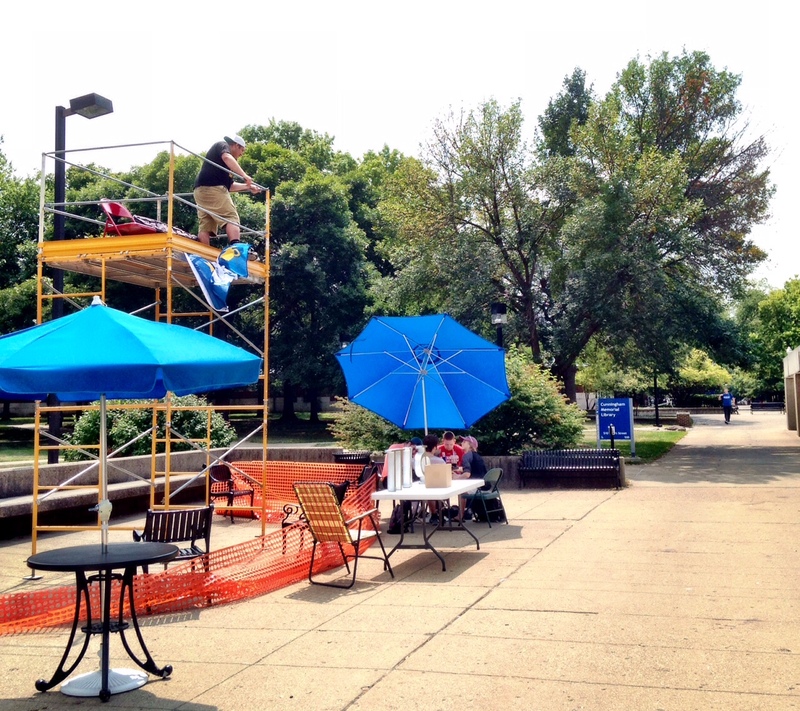 The Pi Kappa Phi Fraternity will be holding their “No Boundaries” events in front of the library, this week. 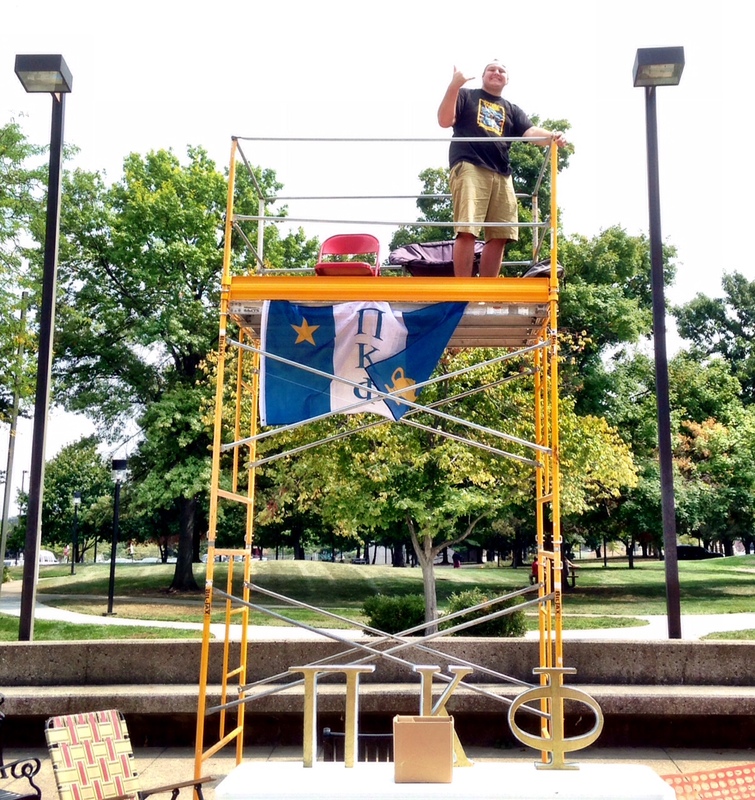 Beginning today the members of Pi Kappa Phi will be sitting on top of the scaffold. This will be done, continuously, until Friday midday. In addition to the scaffold, they will be riding stationary bikes beginning on Wednesday (on the ground, not on the scaffold) and on Thursday, will hold a “pie” throwing booth on the grass behind the cement wall. All proceeds will go to the Pi Kappa Phi philanthropy, which benefits “differently abled” people. VINCENNES, Ind. (AP) — A trove of rare, fragile documents dating to Indiana’s pre-statehood days will soon be digitized and posted online for use by researchers, genealogists and historians. A team affiliated with Indiana State University will scan in the Vincennes, Knox County and Vincennes University records for the project that’s being financed by a nearly $10,000 federal grant. Those records include early minutes of the board of trustees of Vincennes University, which was founded in 1806 and is Indiana’s oldest college. Knox County tax records from between 1814 and 1823 will also be digitized, as will paperwork related to Vincennes’ early French influence that includes correspondence from Vincennes’ first Land Registrar dating to the 1780s. The historic Wabash River city was founded by the French around 1732. From early morning to later in the evening, you’re bound to find some great information and some fascinating activities. 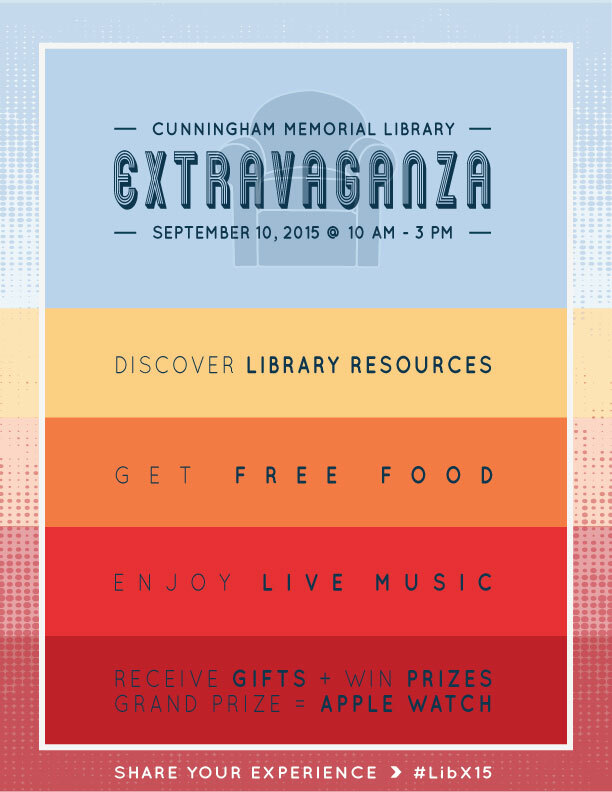 Cunningham Memorial Library is hosting a Graduate Student Open House in the Library Events area on August 19th from 2:30 to 4:00 pm. 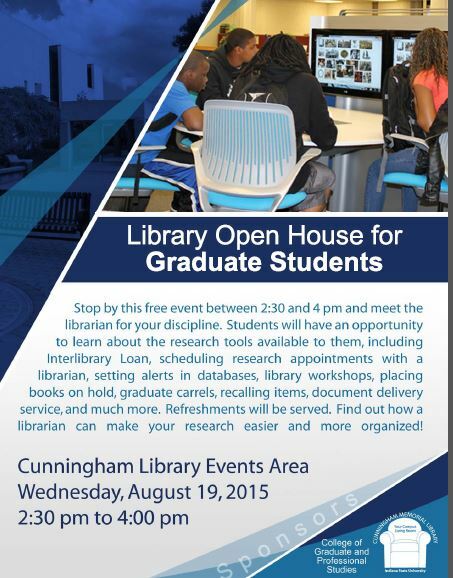 Please encourage your graduate students to stop by and meet the librarian for their discipline. Students will have an opportunity to learn about the research tools available to them, including Interlibrary Loan, graduate carrels, scheduling research appointments with a librarian, setting alerts in databases, library workshops, document delivery service, recalling items, placing books on hold, and much more. 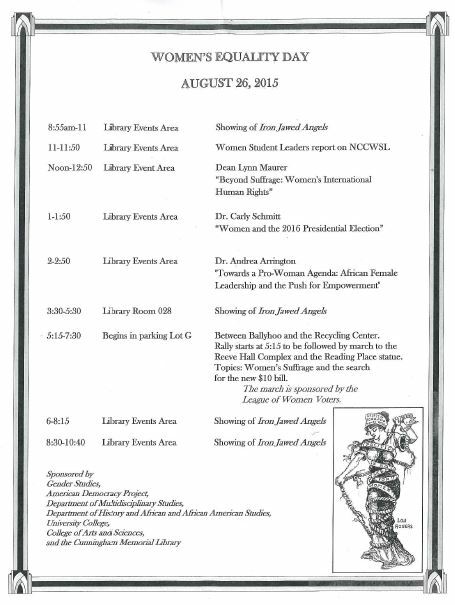 Sponsored by the College of Graduate and Professional Studies and Cunningham Memorial Library. 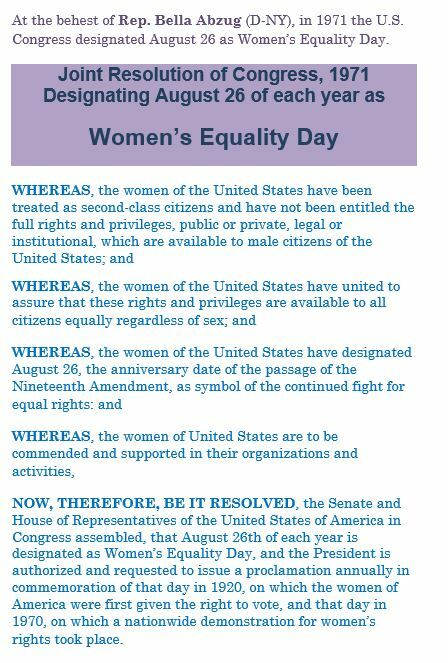 Celebrating 95 years under the 19th Amendment! Frances Kepner, former Head of Cataloging and Special Collections Cataloger, passed away peacefully at her home in Pasadena, California on July 31, 2015. Ms. Kepner retired from the library in 1985, having been a librarian here since 1963.